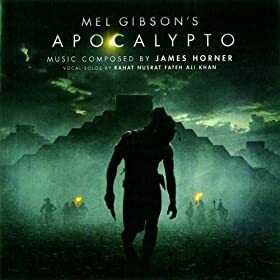 James Horner’s score for this film focusing on ancient Mayan civilization is what you hope it owuld be. Unlike other film soundtracks which should explore the music and the instruments of other cultures but fail to do so (I’m thinking of Last Samurai by one of my favorite composers Hans Zimmer) this soundtrack will put you back in time in Mezoamerica. Wordless vocals enhance the natural instruments and sounds of the time. Birds chirping on some tracks create an amience that is perfect for background music in or near the forest. Some tracks are quiet while others are fast paced and would be appropriate for battles or chases. The track “Sacrificial Procession” uses drums and dissonace to create the sound of something big and bad/dark happening or just right around the corner.